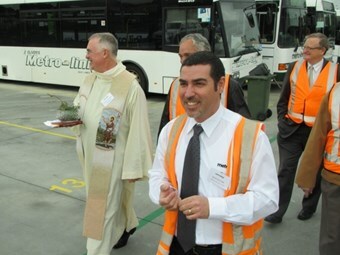 Western Sydney operator Metro-Link launched its new $6 million dollar bus depot at Len Waters Estate west of Liverpool yesterday with about 200 loyal supporters turning out for the event. Federal, state and local politicians, Sydney’s Area 3 operators, suppliers, and industry lobbyists were there to celebrate Giuseppe and Diana Oliveri’s new venture. And – depending on your personal beliefs – the depot received its blessing from a ‘higher authority’ with Father Michael McLean bringing the congregation together in prayer. "It’s my privilege to bless this building and these buses," he says. BusNSW Industry Development Manager and Master of Ceremonies Matt Threlkeld congratulated the Oliveri family on their achievement. "The Oliveri family have been operating since 1954 and they are passionate bus operators with a strong focus on the customer’s experience," Threlkeld says. He says with Sydney’s metropolitan bus contracts ‘in focus’ at the present time, the private industry’s continued investment in depots and in new fleet provides value to the community. "Today is a clear demonstration of that and the opening of this facility is a significant achievement," Threlkeld says. With Transport Minister Gladys Berejiklian unable to attend the launch as planned, NSW Parliamentary Secretary for Transport and Roads John Ajaka stepped in to officially open the premises. Ajaka says NSW could not survive without private investors. "It’s the private business people that are the backbone of any state," he says. "If it wasn’t for the hard work or the risks they take and the management skills that they bring, a state such as NSW would not survive." Ajaka says the O’Farrell Government would continue to send the message that NSW is open for business. "We are here to assist you not control you," Ajaka says. Metro-Link CEO Giuseppe Oliveri thanked the many supporters who took time to help celebrate the depot launch. "It’s a pleasure to have these exceptional colleagues, friends and family gather here," Oliveri says. "These buildings aren’t just bricks and mortar – they are the end-result of a dream." Oliveri says the opening is the realisation of a vision formed back in the early 1950s when the company first started. He paid tribute to his mother Kathleen, who is Metro-Link’s majority owner, and all those who helped design and build the depot. The depot’s principal designer is Giuseppe’s brother Ross Oliveri, a practising draftsman who came up with the original depot concept in 2005. The depot was constructed inside a 12 month period between 2010 and 2011. Although the Metro-Link’s fleet is less than 40 vehicles, the Oliveri’s depot has been built to double the holding capacity through expected growth in coming years. Oliveri says the depot uses equipment that’s carbon-friendly, and has designed staff facilities to help reduce fatigue and provide a high level of personal safety and security. The depot is security gated at the front with surveillance throughout the compound. Mechanical and body repair sections accommodate not just buses but other heavy vehicles, including a registered RTA inspection facility on the site. Metro-Link is the second largest of four partners in Sydney’s Region 3 networked route services, operating alongside Westbus, Busabout and Hopkinson’s, coordinated by Area 3 Management Company. Region 3 covers a large slice of Sydney’s west from Parramatta and Wentworthville, through to Liverpool and Green Valley – and now the newer Len Waters Estate, home of Sydney’s most recent and highly impressive bus depot.